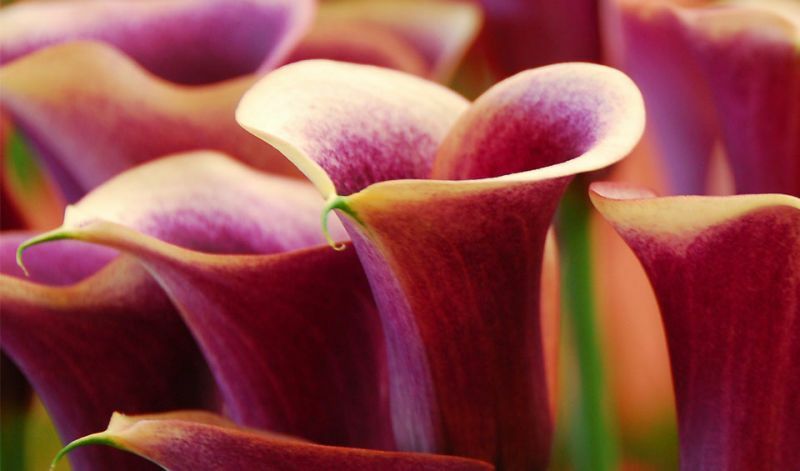 The regal calla lilies produce flowers that are called 'bracts': a funnel-shaped spathe surrounding a central finger-like spadix. The leaves are either solid green or speckled (silvery-white to cream-yellow) and spear-shaped. Many new varieties continue to be hybridized to produce thicker stems with more and larger blooms that have less green in them. 'Black Eyed Beauty' (light yellow, black heart), 'Black Magic' (lemon-yellow), 'Black Star' (deep maroon), 'Cameo' (salmon-orange), 'Chrystal Blush' (pale pink), 'Flame' (orange-red), 'Florex Gold' (yellow), 'Majestic Red' (red), 'Mozart' (apricot), 'Schwarzwalder' (black), 'Solfatare' (yellow) and 'Treasure' (orange).